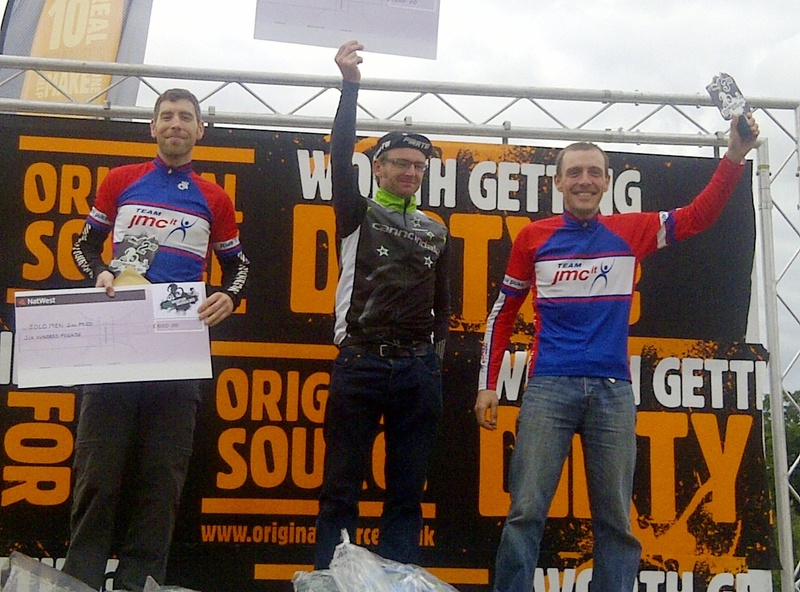 Last year’s Mountain Mayhem solo podium consisted of me in 3rd, Dave in 2nd and Ant White in 1st place. That was well tidy. I was chuffed. Mayhem is still ‘the’ big endurance race for me and I’m guessing for a lot of other people too. To ride to a podium place here is A Big Thing. The sheer size and prestige of the event makes it the first race on the list when I’m planning my year’s racing and it’s one of the key races that I want to be in good shape for. Lining up at the start with Lee and Dave, getting ready for the ‘800 metre run’ to start the race (that somehow ended up being two and a half bloody kilometres), we chatted about how ace it would be to repeat last year’s performance…to arrive on the podium again, in any position… ‘That’d do’, we agreed. Legging it up the start/finish straight after the crackers-long run I finally reached my bike and set off on my first lap….suddenly I’d start to feel some benefit from my spangly white carbon-soled disco slippers instead of trying to run in them like a penguin…. The course was very much the same as previous years, however some of it had been reversed and swapped about resulting in a lap that felt tougher than last year. Conditions at the start were quite damp so much of the hardpack dusty speed of last year’s race was replaced by extremely slippery mud and plenty of crashes. 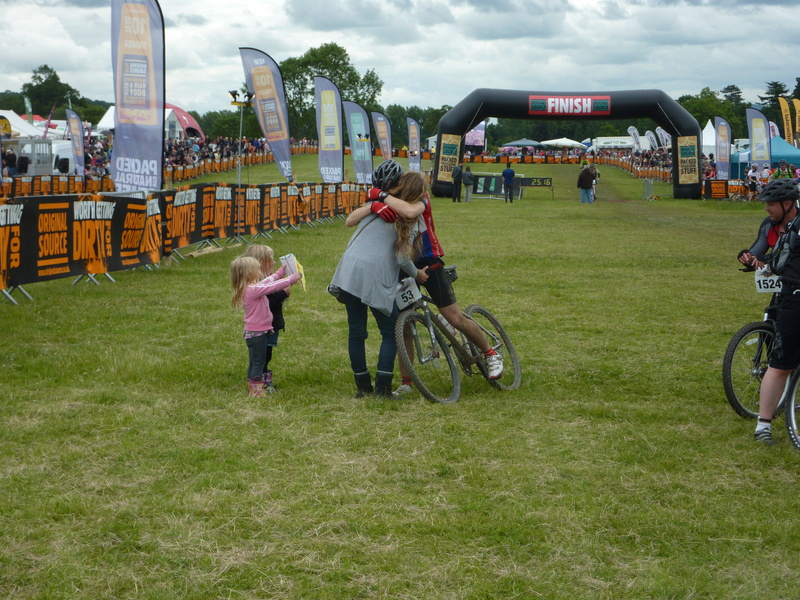 At the end of the first lap I asked Phil to swap the tyres on my main bike to mud tyres ready for the next lap. 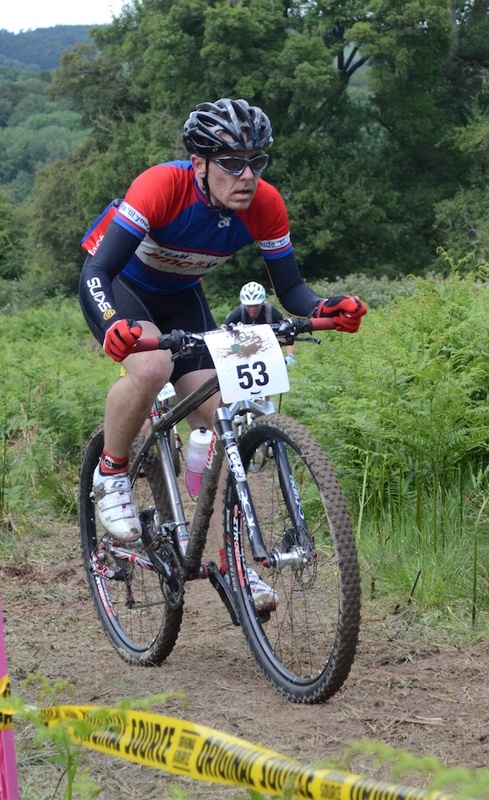 I carried on, crashing, slipping sideways, avoiding other crashes while the showers persisted. I knew I was doing ok but I didn’t know (or really care) where I was in the race until it got dark – the rain had long-since stopped and gradually the muddy sections of trail started to dry out. I was in 4th place then and about 25 minutes behind Dan Treby in 3rd. I was chipping away at the gap, but I knew I’d have to chip away a bit faster to stand a chance of catching him. Eventually I did catch him and we rode together for a short time; Dan was picking up the pace and I was struggling to keep up – ‘perhaps I’ll just have to accept that he’s the stronger man today and sit in 4th place and wait and see what happens’ I thought, self-preservation instincts starting to kick in. I slowed down a bit, mainly to make sure I had a chance of finishing the race. 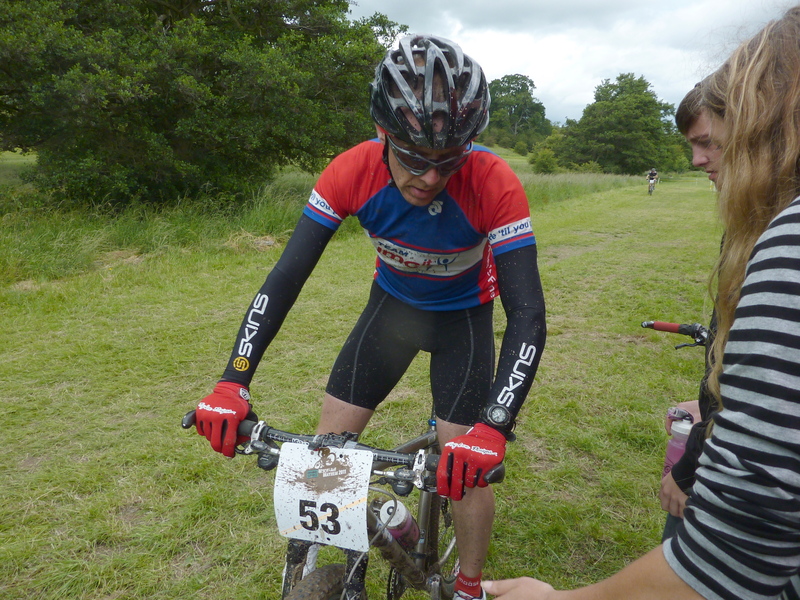 I arrived back at our pit and complained about the rigid fork, the course, Dan’s pace, everything really. It was time to pull my finger out. I picked up the pace and rode with a renewed sense of optimism. I’m not just accepting 4th place. Not like this, sat on a 4 quid chair with my head bowed. Nope, I’ll do it on the bike, with my head held high, all covered in Heinz tomato sauce. I saw Dan in his pit again. I carried on, faster now. Into 3rd place. I probably glanced over my shoulder more than I looked forwards for the next few laps….no sign of Dan chasing after me for hours, but then I saw him again, gaining on me. Disaster. I rode past my pit – Michael was there as usual with a new bottle. I just shouted ‘he’s right behind me’ and carried on up the first climb. Dan was gaining on me. ‘This guy is too bloody strong’ I said to myself, amongst other, more colourful things. He caught me up. I was just about resigned to the fact that I’d been dropped back into 4th when he announced that he’d been sat under a blanket for the last hour or so, drinking tea and eating porridge. The pace of the previous laps had clearly taken its toll on both of us but I’d survived enough to keep going and end up a lap in front. Relief! Just hang on now in 3rd. Dan may be a lap behind but there was a while to go and the rest has clearly done him good, judging by the speed with which he caught me on a climb and then became a blueish dot, disappearing over the crest of the hill. Crossing the line, I remembered it was Father’s Day when I was showered with lovingly home-made cards and gifts from Michael and the girls…I think I might have started to cry a bit. During the race I was doing the pedalling (and crashing and face-pulling) but what really needs to be acknowledged here is the huge amount of effort by a dedicated few going on to keep me fed, (relatively) happy and motivated and to keep the bikes in order. And these guys are supporting two of us racing solo, so a race can involve a total of 40-ish very slick pit stops, two completely separate and sometimes quite complicated set of food needs, a fair amount of grumpiness at times and four bikes (2 each) that are getting thrashed and caked in filth over and over again so they need cleaning, lubricating, maintaining and if the weather changes, tyres need swapping too. Then we need information relaying from the timing tent about our lap times, performance of our nearest rivals so that we know when we need to pick up the pace or when we can afford a ‘safe’ lap. 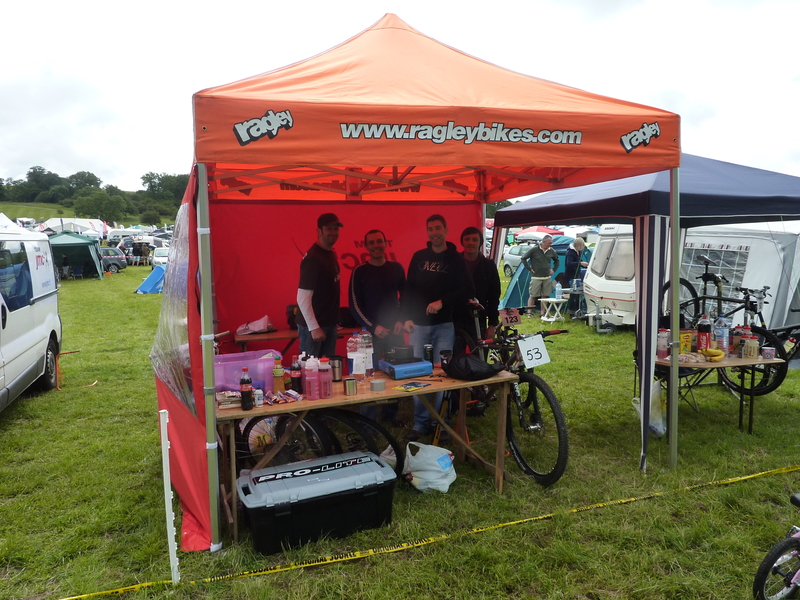 Michael and Wayne are the ‘full-timers’ but some of the support also comes from Deb (who’s also looking after the kids) and the guys who are actually racing in the team categories as well (Budge, Phil, Andy, et al). In many ways I’m extremely privileged that I can call upon this kind of support as well as the help I receive from my great sponsors. I love all of you (almost as much as I love tinned ravioli). Brilliant Jase! Excellent riding and great report. Really pleased for you and Dave. And aint Ant The Daddy?! Tinned Ravoli rules! Just think what you could have done if you’d of had a tin of rice pud too 🙂 Well done Jase. Bloody flipping ace read. Well done. Ravi-flaming-oli. It’s like the new Beetroot / Marrowfat Peas / Sardines but just a bit gayer. Great stuff Jason. Well done to you all. Will be putting this race into next years diary. 40 years old next year and i want to tick lots of things off the to do list. I’ve just caught up now with blogs and things. Well done Jase, very well deserved.